BBCC6 faculty members and awardees. Nurses, advocates, NGO representatives, and physicians at BBCC6. Faculty members Dr. Ahmad Awada, Hope Rugo, and Nagi El Saghir in downtown Beirut after BBCC6. Photos by Hasan Nisr, American University of Beirut. 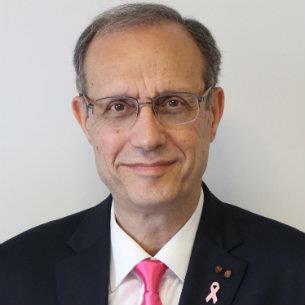 For the sixth year in a row, the Breast Center of Excellence at the American University of Beirut Medical Center (AUBMC) organized its Annual Beirut Breast Cancer Conference (BBCC6) in Beirut, Lebanon. Meeting faculty and over 200 attendees, including medical oncologists, surgeons, radiologists, pathologists, faculty, fellows, and residents, came from all over Lebanon, Syria, Jordan and Egypt, as well as Belgium, Switzerland, and the United States. In addition to didactic sessions, we held three multidisciplinary tumor board sessions with case presentations and discussions. Those have become very popular and good learning forums. Starting at the first BBCC 6 years ago, we realized how important it is to include nursing staff and faculty amongst our speakers and organize special sessions on oncology nursing. Nurses are always at the front line dealing with patients with cancer and families. They make significant contributions and they enrich our knowledge with their observations and recommendations for patient support and management. We find that interaction between oncologists and nurses is informative both ways. Nurses also have a great desire to improve their oncology knowledge and such combined conferences enforce those goals and improve their professional aspirations. We also held a special session for pharmacists. Our oncology pharmacists were delighted and happy to review their experience with chemotherapy preparations, interactions, awareness of side effects, and interaction with oncology physicians and oncology nurses. As for nongovernmental organizations (NGOs), volunteers, breast cancer survivors, and patient advocates, they have become part of our team. They help disseminate awareness, raise funds to support needy patients, participate in patient support groups, and advocate for better patient management. Two conference public debates, one with physicians and health care authorities, and another one with nurses, NGOs, pharmacists and physicians, were part of BBCC6. Issues from access to care; appropriate diagnostic algorithms; breast conservation; sentinel lymph node biopsy availability and training; breast reconstruction; expensive drugs; and multidisciplinary tumor board enforcement at all hospitals, small or large, in major cities or peripheral hospitals, were discussed. Debates were highly circulated on social media, news agencies, and websites. Another successful tradition of BBCC is the presentation of research posters and abstracts by fellows and residents in training. This year, they presented data on outcome of patients with HER2-positive disease with excellent long-term survivals of over 90% seen in early breast cancer. Improved results were also seen with neoadjuvant in locally advanced disease. Best Abstract prizes were awarded to a selection of young investigators. Specialty conferences allow in-depth and active learning. Case presentations and tumor board–like discussions are great educational forums and would be nice additions to all clinical oncology meetings.